Only five percent of all U.S. broadband users use the mobile Web, even though more than 60% of them have devices that can access the Internet, says a study released by market research company Media-Screen. 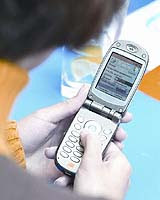 Those surveyed cited extra fees levied by wireless providers and poor connectivity for their reluctance to use their mobile web capabilities. Most American providers charge business class customers a high per-month fee for unlimited access and bundle extra services like wireless email, but have no consumer priced equivalent. For unlimited internet access, Sprint PCS customers have to pay an extra $39.99 per month. Verizon Wireless users need to pay $59.99 per month, and that “unlimited” use is capped at 166MB per day. "Broadband users represent an important audience to track as they have historically driven innovation of online applications by being the first to adopt and embrace new services on the Internet," said Media-Screen director Jean Durall in a statement. According to Media-Screen's Netpop Pocket survey, users utilize their desktop and laptop computers more than twice as much for Net activities than they use their mobile devices, showing that regular broadband use has yet to make the transition to mobile. Even though fewer than one in five mobile users access any sort of television or news content on their phones, Media-Screen predicts that number will increase once wireless providers improve their pricing packages and service quality. Currently, the top mobile activity is gaming.